The quality of the athletics was in keeping with the occasion and the trophies awarded were of the highest order. In this instance, the results of the athletics events are reproduced, although it should be noted that there were also a number of cycle races. Obstacle Race (scratch): 1. W Bell, Clydesdale; 2. DW Mill, Clydesdale Harriers; 3. JJ Watson, Glenpark. Exhibition Cup Team Contest: three teams took part – Edinburgh (2nd 26 pts), Paisley (1st 14 pts) and Burnbank Harriers (dnf). 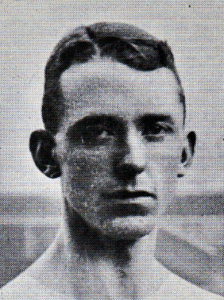 The half mile was probably the race of the meeting with McGough one of the all-time greats of Scottish middle and long distance running and McCafferty a Scottish cross-country champion. The half mile here had a very big field and McGough won by 6 yards. Good weather, good close competition, fewer races than usual to organise plus a subsidy – a good day all round. Finally, although it was a shorter programme, there were numerous heats for most races. The 330 yards for instance had 73 competitors and the half mile cycle event had eight heats. The meeting was successful enough to be repeated the following year where we are told that ‘valuable money prizes were offered’ at a meeting which started at 1:30 and lasted until after six o’clock. There were professional meetings every weekend and the sporting public had a choice whether to watch the amateur variety provided by the likes of Clydesdale Harriers, Maryhill Harriers, West of Scotland, Edinburgh Northern, etc or the professional kind with money prizes and often enough betting at the trackside. There was pressure on the clubs to make their sports as attractive as possible, hence the boxing matches, the cycling, motor cycling at Parkhead and so on. The question of professional and amateur athletics at this time is intriguing enough to win some student a PhD! The Clydesdale Harriers Sports were held on 4th July, 1903, at Meadowside Park, the ground of Partick Thistle. The handbook tells us that they were very successful with good weather and a splendid entry. A profit was made which enabled the club to pay expenses and still have a ‘nice sum’ left over. In the quest for a good attendance the club had added a five-a-side tournament, a boys’ race and cycle races. In the 5-a-side Petershill defeated Yoker Athletic 2-0. The meeting was a long one and the ‘Herald’ said that the football could have been dispensed with and that the boys’ race was neither “a thing of beauty” for the spectators, nor a “joy forever” for the runners. Entries were prodigious – 25 heats of the open 100 yards, five heats in the half mile, six heats for the boys’ 100 yards, the 330 yards had nine heats. There were entries from all over Scotland including Saltcoats AC, Grange Harriers, Rutherglen Harriers as well as all the major national clubs. Many close finishes delighted the spectators but there were no big names on show. Events included a 100 yards handicap with 22 heats, 2 semi-finals and a final which was won by McEwan of Bellahouston in 11.2 a 300 yards handicap with eight heats, and a final won by D Burdett, Garscube Harriers in 34.2 seconds; a 1000 yards handicap won by Sam Carson of Garscube who was off 57 yards and broke the tape just ahead of John McGough who set a new all-comers record of 2:17; a Two Miles Walk won by James Boyle of St Aloysius FC; a Two Mile Handicap in which all three prizes were won by members of CH – Sam Stevenson, W Robertson and James Reston, won in 9:26; a high jump and two amateur bicycle races. On the same day, there was a professional sports meeting at Celtic Park organised by Mr Fred Lumley which was a great success. There were two races – 120 yards and half-mile handicaps with 57 entering the sprint and 58 for the half-mile – and the winners of the various heats were listed along with their starting prices. eg 120 yards, Heat 1 Richards, Betting 3 to 1 on; Heat 2 McGhie, Betting 7 to 1 agst; etc . Note that this was not organised by any of the football clubs but by Fred Lumley who was a great patron of amateur sport and awrded the shield still presented to the wining team in the national cross country championship. “Our Annual Sports this year took place at Celtic Park on 27th May, 1905. Although we had a special attraction in a Four Miles handicap in which A Aldridge who won the International Match in Dublin and the AAA 10 Miles championship, competed, along with Sam. Stevenson who won the event, we did not get the support that we merited. This could be accounted for by the fact that the Charity Cup Final was played that day at Ibrox, Celtic and Third Lanark being the finalists. We were however, able to show a Balance Sheet with a few pounds to the good. There its in a nutshell. Annual Sports which were expected to make a profit and often did, plus other work to spread the amateur gospel. There were almost always sports in addition to the main event – at one point there were Wednesday evening meetings in May, at another there were meetings in places where hitherto there had been mainly professional sports and so on. They did not always make a profit, but the Committee persevered with new meetings in new places. But back to the 1905 Annual Sports meeting ….. The Glasgow Herald had this to say about the Four Miles handicap: “A Aldridge, the 10 Miles English champion, honoured the Clydesdale with his presence, and if he did not quite come up to expectation, he at all events created a very favourable impression, and when he comes North again, as he has promised to do again soon, he will perhaps put in an even better performance than he did in the Four Miles handicap. 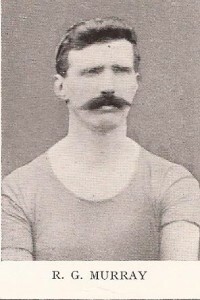 The winner of this was S Stevenson, the ten miles Scottish champion. He had but 80 yards from Aldridge, which was a most reasonable concession, and yet the Englishman was unable to give that start. It was an educative race as far as tactics are concerned, and the Scotsman has nothing to learn from Aldridge in this respect. Every time the latter tried the forcing game, Stevenson responded, and when the crucial stage was reached supremacy lay with the Scotsman who finished the distance in 20 min 18 2-5th sec. “ and the article went on to praise Stevenson as the best runner over 2 miles that the country had produced. The programme had two bicycle races as well as the following: 100 yards had 24 heats, 4 semi finals and a final won by JP Stark (photo below) who had won the SAAA 100 yards in 1904 and would win the 100/220 yards double in 1905, the two miles walk won by Quinn of Motherwell who had won the SAAA title in 1904 and would do so again in 1905, 1000 yards handicap won by Tom Jack from Edinburgh who was already a medal winner in the national championships and would go on to dominate the distance events for several years, a 220 yards handicap with ten heats and a final which was won by Mair of Bellahouston in 22.8 seconds.